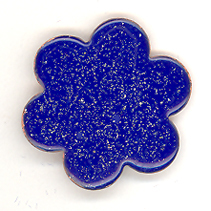 This 18 gauge flower only had 2 layers of enamel, so no doming was necessary. After total success with my green flower necklace and another black and white necklace, I ran into some trouble with the yellows/oranges. The enamel on all 3 of the flowers I did in those colors cracked. So, I got out 3 more copper flowers and repeated the process all over again. The same thing happened! I’m pretty sure I did the exact same process with all of the pieces, as I was working in “batch mode”. Any suggestions? That is COE (coefficient of expansion) at work. The enamel and the metal are expanding/contracting at slightly different rates as they heat and cool, and the glass, being the only thing that CAN break, does. I can’t say why one color worked and the other didn’t, but I’d guess that it’s either chemistry (different minerals used to color enamel = different rate of expansion), OR (more likely) that you used a heavier hand when sprinkling the yellow/orange enamel. Are the flowers domed? A domed shape (even slightly domed) will resist the expanding and contracting movement. Counter-enameling is probably the solution at this point, if you didn’t dome the metal. Next time you can work in a thicker gauge of metal. That will also prevent cracking of the enamels and warping of the metal. Counter-enameling is putting a layer of enamel on the back of the piece to counteract the stresses caused by COE on the front of the piece. Almost all cracking in enamels is caused by COE problems. Some things disguise themselves as other types of problems, but they most often turn out to be COE issues. Taking enamels out of a hot kiln into a cold garage? Crack. That’s a COE problem. Enamel too thick? COE problems. No enamel on the back to counter the weight of the enamel on the front? COE problems. Warping caused by a rectangular shape? COE problems. Remember to keep the torch off the front, if possible. It could discolor your enamels. Let me know how it goes, Vicki, and thanks for letting me post this. I have put off selling my work in public venues for years. Oh sure, I’d sell, barter or gift with friends, but I wouldn’t take the final step and actually offer my work to strangers. I finally overcame that (thank you to my friends who pushed and helped) and so far have put 2 items on Etsy! A quiet moment of joy as I appreciate a completed job, done well. The truth? It was nerve wracking! My husband calls me 90% woman because I do 90% of everything and leave the last 10% for him (usually the clean up, poor man). Figuring out the last 10% of selling my work on Etsy meant photos, descriptions, shop design, and so many details that I’ve, until now, avoided. Oh, and pricing! I just got the willies thinking about it. Anyway, I’ve made the mental leap and am so happy to finally share my handmade books and jewelry with people that I don’t actually know. My next personal goal? To keep putting new things in my shop and not falling into my usual, “There, that’s done” mode. I’m an excellent starter, but I get kind of cranky when I have to maintain things. Does any of this sound familiar? If so, I encourage YOU to go the last 10% and finish something important to you, whether it’s putting up an online store or sewing your first Coptic stitch! Have a glorious day, and FINISH something! Lark Books is doing a new one! “Showcase 500 Handmade Books,” a collection of handmade artists’ books, juried by Julie Chen. They’ve just put out a call for entries. It’s a call for books with content. Send in your photos. I can’t wait to see YOUR name in the new book! Q. I’ve been fascinated with your website and its offerings, but am not sure I am ready to equip my studio for etching sterling silver. Can I etch silver, either sterling or fine? A. One can etch silver, but it takes a different chemical and different equipment than one would use for etching base-metals (copper, brass, nickel-silver). Most people use nitric acid to etch silver (either sterling or fine), which can be very dangerous (I burned my eyes a little the first time I used it), and it has a short shelf-life. I etch base-metals in ferric chloride (relatively benign). If I can avoid etching silver, I do. 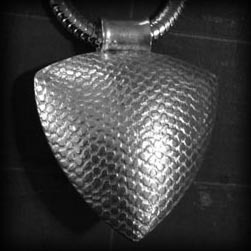 For texture, I tend to either use a rolling mill or else hand-texture the silver with a hammer or flex-shaft. If you absolutely must use nitric acid, please follow all the safety instructions. Thanks for the great questions, Elaine.